This Folding Stool contains no metal. No screws, nails, or staples were used. Everything is held together with glue and 1/4" dowel pegs. All of the material is poplar. All of the movable joints pivot on 5/8" diameter dowels. When it's unfolded for use, the stool stands approximately 15 3/8" high, and the seat is 14" wide by 11" deep. 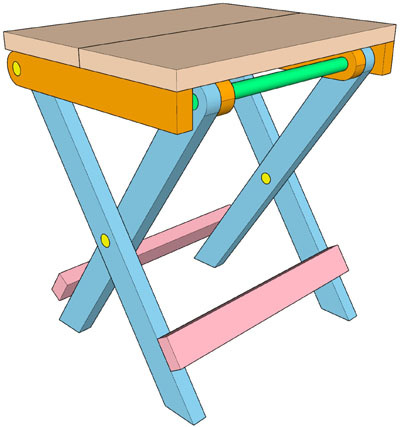 When it's folded (as in the lower-right image above) and standing on the tips of its legs, the stool stands 18" high, 14" wide, and 3" thick. The stool is intended for sitting only. DO NOT attempt to stand on this stool. Though it's pretty strong, the stool has limited side-to-side strength or stability. But it makes a convenient place to sit on while working in the garage, small shop, washroom, or even a campsite. Best of all, it can be folded easily and stored in a small space. I chose to apply no finish because my stool was built to serve a strictly utilitarian function: it's used in a shop where it gets knocked around. But you might choose to apply a finish. If you do, oil or stain should be preferred over paint since the parts rub together at the pivot points, possibly causing a surface finish such as paint to become marred or even rub off. I didn't originate the design of the Folding Stool. There are several examples of it on YouTube. Some of the best examples were created by Steve Ramsey, a very popular woodworker on YouTube. 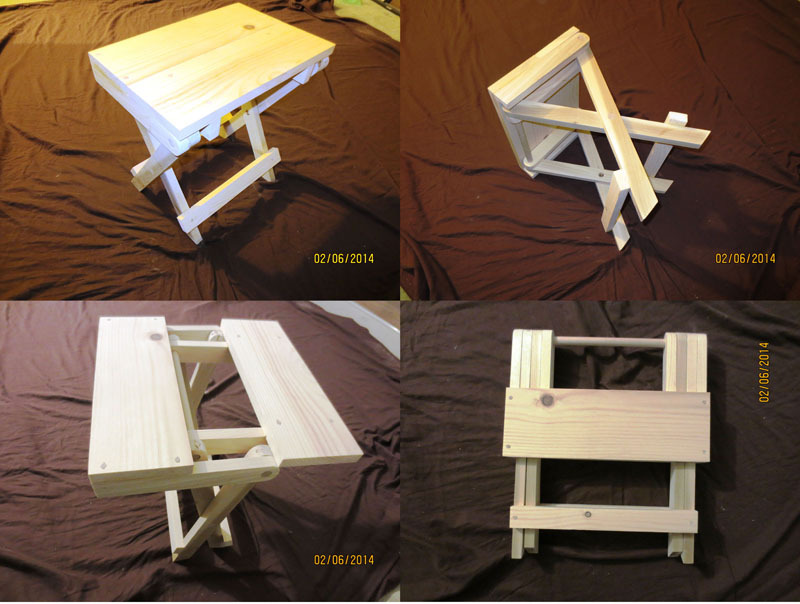 I built the folding stool twice. But I was unhappy with the size of the first version, so my second version is slightly larger. And, it's larger than the design that Steve Ramsey presents in the links below. So don't get his information confused with the information in the link provided above.